As the warm weather and summer holidays are just around the corner, I thought I’d write a post about managing resort-based holidays while following a FODMAP friendly diet. Last summer, Ev and I, along with a few friends, flew down to Cabo San Lucas in Mexico for the 4th of July long weekend. It was pure bliss, even if we did get a little bored on the second last day (thanks for the rain, weather man!). 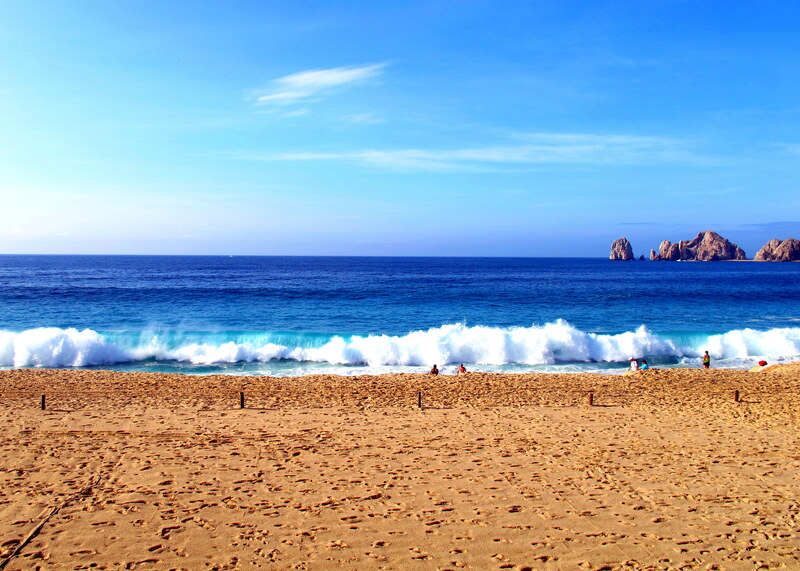 We spent four days relaxing and exploring downtown Cabo, not having to worry about cash at the resort, as everything was included. I was initially concerned about what I would eat but, given that corn and avocados (I’m okay with polyols) are staples in every Mexican restaurant I’ve ever been to, I thought it shouldn’t be too bad. Luckily, I was right. 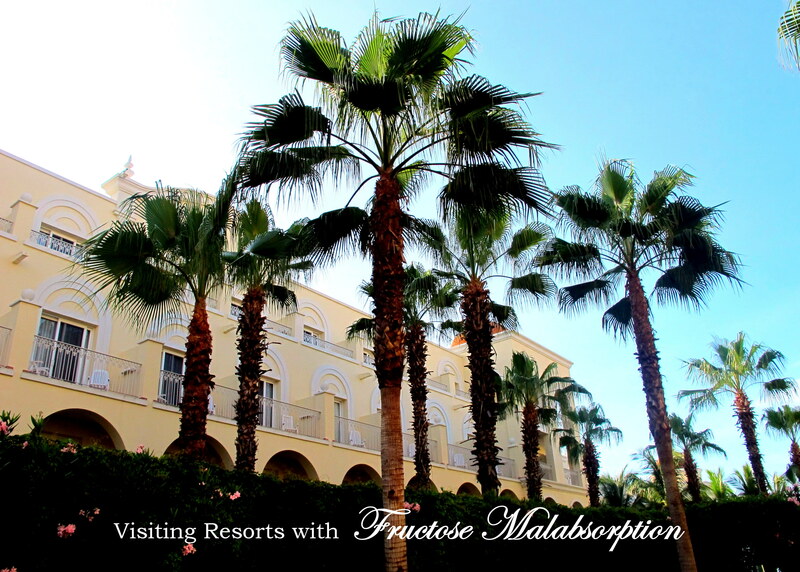 The following will outline how to successfully manage a resort-based holiday with fructose malabsorption. Step 1: Can the resort cater for your dietary requirements? From the beginning, when you’re browsing websites, many will state specifically whether they can cater for certain diets and will ask you to list dietary requirements when you book your stay. If they don’t, you can always call or email and double check. However, as FODMAPs and fructose malabsorption are still such unknowns, you might choose to contact the resort and ask anyway. If the resort cannot cater for you, it’s up to you to decide whether you will go and supply your own foods (if possible) or you will find somewhere else. If you don’t speak the language, flash cards listing the ingredients you can and cannot consume in the language spoken at the resort will help prevent a lot of confusion. Make sure the lists are clear and concise as to what you can and absolutely cannot consume – perhaps even just handing them the “Can Eat” list might be easier. If at all possible, pack an emergency food supply (for transit and when you’re out on the town exploring) and bring a stash of fructose-remedies, just in case. This won’t be possible everywhere you go, due to customs regulations and the like – it’s one extra point to research before you go. Apple cider vinegar (apparently FODMAP friendly in 1-2 tbsp. servings). Non-perishable foods, or at least foods that will keep well for a few days in warm weather in a freezer bag (so no yoghurts or cheeses). Foods that won’t tax your gut too much, especially if you plan on being tempted by local delicacies that you haven’t tried before – give yourself the best chance for success. A variety of foods for different meal times. See Road Tripping with Fructose Malabsorption (step 3) for a complete list of foods that may be suitable. Any other methods that you can take with you that is feasibly going to be useful in case of a reaction. Something along the lines of Buscopan or Beano might be suitable but I do not recommend relying on a product you haven’t tested before to stop a reaction unless you have no other choice. Buscopan contains sucrose, so is listed as inappropriate for those with “fructose intolerance.” I am assuming that they mean HFI here (as we know sucrose is safe for FM) but use your discretion when deciding whether or not to try it – it might help some with IBS but it might not help at all or even worsen your symptoms. At the Riu Santa Fe in Cabo, if worst came to worst, I could have lived off potatoes, avocado, eggs and corn chips. The buffet was amazeballs. Using your flash cards (or a friend who happens to speak the language fluently), double check the ingredients with the staff for anything that could potentially hide some FODMAP bombs and decide what is safe for you. For example, the guacamole: is it just avocado, salt, olive oil and lemon juice or did they throw in some garlic, too? Stay AWAY from the doughnuts at the breakfast bar, no matter how tempting they look – they’re just not worth it. 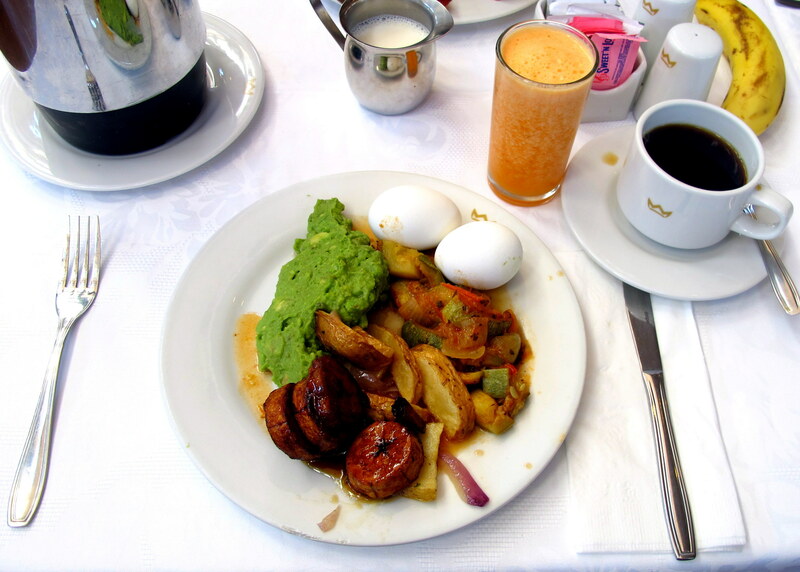 Instead, I opted for a healthier breakfast of hard-boiled eggs, guacamole, sauteed veggies (if safe), baked potatoes and plantains in maple syrup for the sweet note. Plantains are like a cross between a banana and a potato – I don’t know for sure if they’re low FODMAP but they’re really good! The juice bar luckily had fresh squeezed OJ, so I could drink a bit of one of the pre-poured glasses. All the other juices looked phenomenal, including a really healthy (and delicious, according to Ev) green juice but of course it contained apple. Research (and experience) shows that stress is a major trigger for many with IBS style symptoms. Do yourself a favour and take a break from the stress while you’re on holiday and it could go a long way towards reducing reactions. In fact, many people report that they are able to tolerate foods on vacation that they normally could not eat back home – though I’m not sure whether this is due to lack of stress or the quality of foods they’re eating, or maybe a combination of the two. All the steps above, especially planning ahead (and not just for the eating side of things), will help you to relax while you’re actually away and make the most of your well-earnt break. If you have any new suggestions for managing resort travel with dietary restrictions, please let me know in the comments section below. This entry was posted in Not A Recipe, Travelling with Fructose Malabsorption and tagged all inclusive, Cabo San Lucas, dessert, dinner, entree, FM travel series, FODMAP, FODMAPS, fructard, fructose friendly, fructose malabsorption, gluten free, healthy, holiday, Los Cabos, low fructose, Mexico, resort, Seattle, travel with fructose malabsorption, trips, vacation, vegan, vegetarian. Bookmark the permalink.